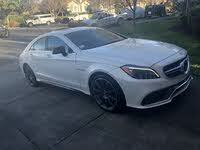 CarGurus has 8,318 nationwide S-Class listings starting at $1,500. Since Mercedes-Benz introduced the sixth-generation S-Class luxury sedan in 2014, the German automaker hasn't rested on its laurels when it comes to its flagship vehicle. That makes sense, considering strong competitors like the Bentley Continental GT and Masareti Quattroporte, along with luxury sedans from BMW, Lexus, and Infiniti, have been nipping at the S-Class's heels. So to keep pace and maintain the S-Class's prominence in this upscale automotive segment, Mercedes has rolled out several variants bearing the "S" nomenclature over the past few years, including the high-performance AMG S63 and S65 Sedans, the S550e Hybrid, the well-received S-Class Coupe, the souped-up AMG S63 and S65 Coupes, and the S600 Maybach, a top-of-the-line stretched version of the S-Class Sedan. For 2017, the S-Class lineup expands even further with the addition of the sporty S-Class Cabriolet and its high-performance counterparts, the AMG S63 4MATIC Cabriolet and the new Mercedes-AMG S65 Cabriolet. The first 4-seat convertibles available in the S-Class configuration since the early '70s, the three vehicles push the open-air driving experience to new heights of comfort, technology, design, performance, and luxury. In designing the S-Class Cabriolet, Mercedes has focused on such areas as stability and rigidity, safety, cabin comfort, quietness, and ease-of-operation of the roof and rear luggage compartment. The Cabriolet's exterior design was also important. It starts up front with the eye-catching black diamond grille that features a single silver horizontal slat and the Mercedes three-pointed star firmly planted in the center. The grille hovers over an aggressive bumper with large air intakes in the lower front and sides, and it's framed by angular LED headlights available with optional Swarovski crystals for the turn signals and daytime running lights. This is, after all, a Mercedes convertible, so there's the matter of keeping up appearances. The Cabriolet borrowed its dynamic hood and sidelines from the Coupe and crouches in a cat-like stance, as if ready to pounce on the road. 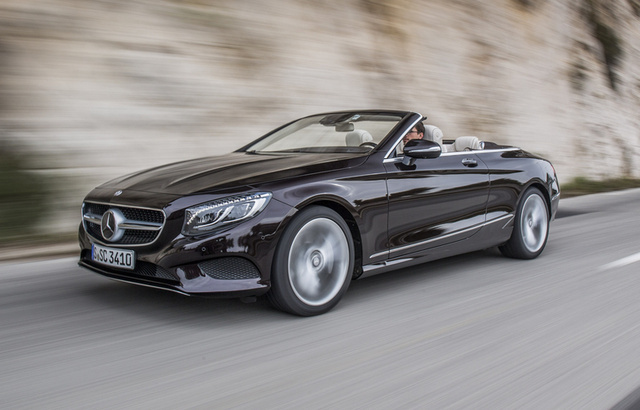 The low cabin line ensures a windswept look as the vehicle cuts through the air and, along with the sculpted front end and sidelines, contributes to a drag coefficient of just .29 Cd, a new benchmark for a Mercedes convertible. Efficient underbody paneling, rear cladding, aerodynamic side mirrors, and wheel spoilers also ensure optimal air flow around the vehicle. In addition to reducing drag, the carefully crafted exterior design helps reduce wind noise and keeps passengers from being buffeted by turbulence when driving with the top down. Special sealing around the doors, double glazing on the windows, and bodyshell upgrades also keep wind noise down, as does the three-layer acoustic soft top. Available in black, dark blue, beige, and dark red, the top opens and closes in less than 20 seconds at speeds of up to 28 mph. As it retracts, the luggage compartment partition extends to provide a storage space behind the rear seats. The newly designed soft top features a tension-arm design that minimizes the need for bulky closures, which could impair the Cabriolet's overall appearance. Under the hood, the base S-Class Cabriolet gets the same 4.7-liter twin-turbo V8 engine powering the S550 Sedan, the S550 4MATIC Sedan, and the S550 4MATIC Coupe. It delivers a generous 449 hp and an equally impressive 516 lb-ft of torque, capable of driving the drop-top from 0-60 mph in about 4.6 seconds. The V8 links to a 9G-TRONIC 9-speed automatic transmission and posts fuel-economy numbers similar to the Sedan, around 17 mpg city/26 highway. For higher levels of performance, owners can opt for either the AMG S63 Cabriolet or the new Mercedes-AMG S65 Cabriolet. A hand-built AMG 5.5-liter twin-turbo V8, pumping out 577 hp and 664 lb-ft of torque, provides power for the AMG S63 Cabriolet, driving it from 0-60 in 3.9 seconds and delivering a top speed of 186 mph. The brand-new Mercedes-AMG S65 Cabriolet ups the ante even more with a beefy 6.0-liter V12 powerplant that generates a whopping 621 hp and 738 lb-ft for torque, making it the most powerful 4-seat convertible in the world. Both vehicles come equipped with a number of innovative technologies, including AMG 7-speed SpeedShift automatic transmissions, AMG-tuned suspensions, high-performance brakes, and AMG body styling. The same high-powered V8 and V12 engines are available in the AMG S63 and S65 Sedans and Coupes, respectively, while the S600 Maybach also gets the twin-turbo V12, but tuned for 523 hp. Naturally, fuel-economy numbers remain low for the high-performance trims (the S600 manages 13/20), but buyers seeking luxury combined with economy can opt for the S550e Hybrid Sedan, which retains a 3.0-liter twin-turbo V6 gas engine coupled with an electric motor. The hybrid powerplant can drive the S550e from 0-60 mph in about 5.2 seconds, while posting fuel-economy numbers as high as 54/63. Owners in states with inclement weather can also opt for several trims with the automaker's 4MATIC all-wheel-drive system, including the S550 4MATIC Sedan and the S550 4MATIC Coupe, in addition to the AMG S63 4MATIC Cabriolet. With the German automaker devoting much of its attention for 2017 to launching the new S-Class Cabriolets--as well as a next-generation E-Class and a new C-Class Cabriolet--it has made minimal updates to the rest of the S-Class lineup. Recent reports indicate a mid-generation refresh in 2018, but until then, all S-Class Sedans, Coupes, and Cabriolets continue to display a stylish exterior design and a full complement of top-end features, including all-LED exterior and interior lighting, handcrafted cabins, power heated seats, advanced instrumentation and controls, wood and leather multifunction steering wheels, an ECO start/stop system to help improve fuel economy, a full range of safety equipment, and a choice of wheels up to 20 inches in size. Owners who want to upgrade their vehicles even more can choose from a long list of optional features, including leather upholstery, 4-zone climate control, heated rear seats, a heated steering wheel, upgraded entertainment systems, innovative safety systems, and much more. With all this going on, it appears the S-Class will be able to hold off the competitors nipping at its heels for at least the next few years. What's your take on the 2017 Mercedes-Benz S-Class? Have you driven a 2017 Mercedes-Benz S-Class? This vehicle has a normal lead acid battery and also a lithium ion starter battery. It is stored for 6 month intervals. Must each battery have its own dedicated battery tender hooked up?